Light switches and electrical outlets are small but significant sources of air leaks which may often cause an increase in the cost of energy. The easiest way to reduce heating and cooling costs within your home is to insulate your electrical outlets. The gasket sealants work by sealing off the wall cavity behind outlets and switch areas from the living space which prevent drafts from coming through. By retaining the heating and cooling of your home, electrical outlet insulation can ultimately save you 20% on your heating and cooling bill. The price of electrical outlet insulation is also inexpensive, so installing it is very cost effective. All that is required to install gasket sealants are the outlet insulation and a screwdriver. You must first start off by making sure that the power in the area you are working is turned off. 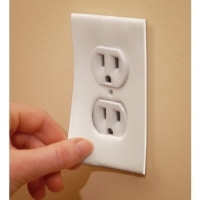 To install, remove the cover plate, line up the holes of the electrical outlet gaskets to the electrical outlet, and then carefully reattach the electrical outlet cover. In a few easy steps, you will prevent air leaks and conserve energy.